Once again, it’s been a good quarter for Big Oil. 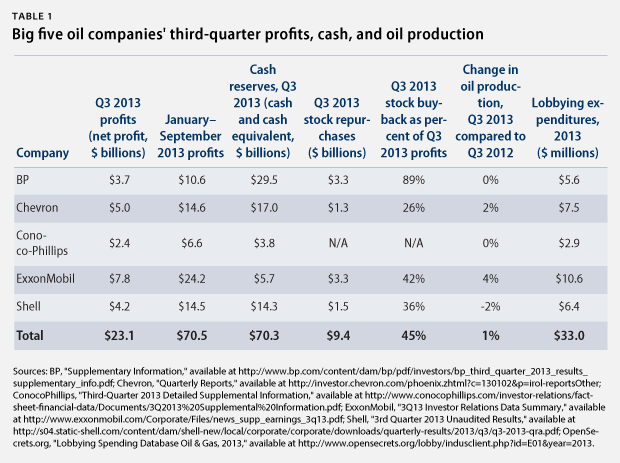 The big five oil companies—BP, Chevron, ConocoPhillips, ExxonMobil, and Shell—reported $23 billion in combined profits for their third quarter of 2013. That’s $175,000 per minute. Together, these five companies earn more in one minute than 95 percent of Americans earn in a year. These profits were slightly lower this third quarter compared to 2012, primarily due to lower (but not low) oil and gasoline prices. Gasoline averaged $3.63 per gallon in the first 10 months of 2013, slightly less than last year’s record of $3.68 per gallon. Even though profits were lower, the big five companies continue to enrich their largest shareholders and senior executives by using a large share of profits to buy back their own stock. This past quarter, the combined buybacks of the companies (save ConocoPhillips) were nearly $10 billion, or 43 percent of the four companies’ total profits. In addition, these five companies are sitting on more than $71 billion in cash reserves. Oil and natural gas lobbyists have spent more than a year urging lawmakers to maintain targeted tax breaks for extracting and transporting their products, but there are signs of a growing fear within the industry that impending legislation to overhaul the tax code for the first time in a generation would eliminate most of those incentives in order to lower the top-line rate paid by all companies. Environment & Energy Daily noted that House Ways and Means Chair Dave Camp’s (R-MI) tax reform bill could “completely eliminate the so-called Section 199 manufacturing credit, which applies to oil and gas producers along with a variety of other U.S. manufacturers.” This tax credit was designed to encourage manufacturers to keep their factories in the United States. This incentive should not apply to oil and gas production since oil and gas fields cannot move overseas. In fact, the Congressional Joint Committee on Taxation estimated that this special tax break accounts for $14 billion—or nearly 60 percent—of the $24 billion in tax breaks that the big five companies will receive over the coming decade. 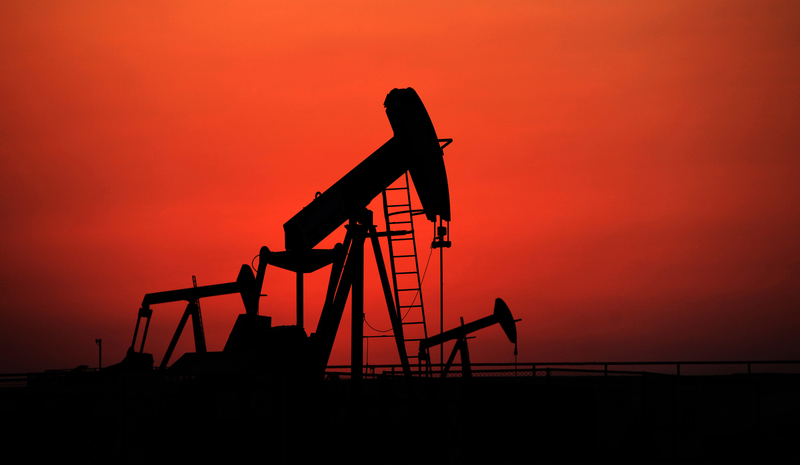 The committee also reported that foreign tax credit deduction and deduction for intangible drilling costs, will save the big five oil companies $7.5 billion and $2 billion, respectively, over the coming decade. The big five oil companies spent a total of $33 million lobbying through the third quarter of 2013. While this may seem like a lot of money, it is actually quite a good investment. If the big five successfully retain their tax breaks, they will save $73,000 on their taxes for every $1 spent on lobbying. The Senate and House Budget Committees will meet between now and December 13 to attempt to arrive at a consensus deficit reduction package. Stripping the tax code of these special Big Oil tax breaks for these five companies that earned $72 billion so far in 2013 would provide $24 billion of revenue. This is revenue that might otherwise be cut from cancer research, Head Start, food stamps, or other vital middle- and lower-income programs. Eliminating special tax breaks for the big five oil companies would protect vital investments for our health, safety, and prosperity. Daniel J. Weiss is a Senior Fellow and Director of Climate Strategy at the Center for American Progress. Tiffany Germain is a Senior Climate and Energy Researcher in the ThinkProgress War Room at American Progress. *Correction, November 5, 2013: This article incorrectly stated the total dollars spent on big five oil company lobbying and the tax savings for every $1 spent on lobbying. The correct numbers are $33 million and $73,000, respectively.